Schedule is subject to change. Please visit the festival’s website for the most updated information. All films will be screened in Romanian with English subtitles. Seating is limited, please arrive early. Viewers discretion is advised. Some movies may contain disturbing images. HAS ROMANIAN ENTREPRENEURSHIP GONE GLOBAL? Romanian entrepreneurship has come of age. In recent months, companies founded by Romanians worldwide, using Silicon Valley as a launchpad for their ventures, have achieved major acquisitions, partnerships and financing. Join us to hear their stories ! RSVP by May 3, 2015 to Kelley Blakeman 415 989 5900, kblakeman@cbmlaw.com Note: SIGN UP EARLY ! Building security requires all individuals who enter the building to be signed up in advance. Due to space considerations we will be able to accommodate a limited number of guests. Monday December 1,2014 at 10:00AM , The Mayor of San Francisco will lead a ceremonial of raising of the Romanian flag, at the City Hall of San Francisco, in honor of, the National Day of Romania. Alegerile pentru Preşedintele României au loc duminică, 2 noiembrie 2014, între orele 07.00 – 21.00! Pot vota toţi cetăţenii români aflaţi în străinătate (inclusiv turiştii), pe baza unuia dintre actele de identitate, valabile în ziua votării, prevăzute de Decizia nr. 10/ 2014 a Biroului Electoral Central. De asemenea, vă recomandăm să accesaţi site-ul Ministerului Afacerilor Externe, secţiunea dedicată alegerilor pentru Președintele României: http://www.mae.ro/prezidentiale-2014, dar şi pagina de web a Biroului Electoral Central www.bec2014.ro. Discover cinematic gems featuring award-winning filmmakers and enthralling debuts. The audience will have the opportunity to experience the multifaceted aspects of contemporary Romanian cinema. The film festival will introduce students and the general public to the vibrant and groundbreaking Romanian New Wave. The filmmakers and screenwriters showcased by the festival grapple in unique ways with the relationship between art and power, censorship and repression, the cultural and linguistic diversity of Eastern Europe, and the challenges of living through post-communism. The program includes Cristian Mungiu’s celebrated thriller “Beyond the Hills” which won awards for best screenplay and best actresses, Cosmina Stratan and Cristina Flutur, at the 2012 Cannes Film Festival, and Serban Oliver Tãtaru’s documentary “Anatomy of a Departure” (2013). In addition, since director Serban Oliver Tãtaru and Cannes-winning actresses Cosmina Stratan and Cristina Flutur will be our special guests, the audience will have a unique opportunity to hear from them during our Q&As and roundtables. The Romanian film festival sparks an interdisciplinary and comparative discussion on the legacy of the Soviet era in the contemporary world, and invites its audiences to see key moments in post-1945 European history from a Romanian perspective. The event is presented by the Center for Russian, East European & Eurasian Studies at Stanford University (CREEES) and the Institute of Slavic, East European, and Eurasian Studies at the University of California, Berkeley (ISEEES) in conjunction with Taube Center for Jewish Studies, Stanford University, the Europe Center, Stanford University, Bechtel International Center, Stanford University, Graduate Student Council, Stanford University, the Romanian Student Association, Stanford University, and the Special Language Program, Stanford University (SLP) , the Graduate Film Working Group at UC Berkeley, with additional support from the Language Center, Stanford University, Slavic Department, Stanford University, the Honorary Consulate of Romania in San Francisco, Dana Beldiman, Honorary Consul General, George Roth, Honorary Consul, Department of Cinema, San Francisco State University, Department of Theatre Arts, San Francisco State University, Blue Collar Films, UNAFF/UNAFF Traveling Film Festival, Palo Alto/Stanford, Goethe Institute, San Francisco, CA, Casa Romana (Bay Area Romanian Community), California European Cultural Initiative/Hungarian Film Festival in San Francisco (CECI), Recognos Inc., KNOTCH, and the “Nicolae Tonitza” High School, Bucharest, Romania, Fundatia Semn, Romania, and sponsored by the Stanford Graduate Student Council, Billie Achilles Fund, Bechtel International Center, Stanford University, and the Romanian Cultural Institute, New York. “Youth Participation, Paths to Citizenship”. In the opening of the presentation we will present the work of the Foundation in Romania and the legacy of Ion Ratiu as well. 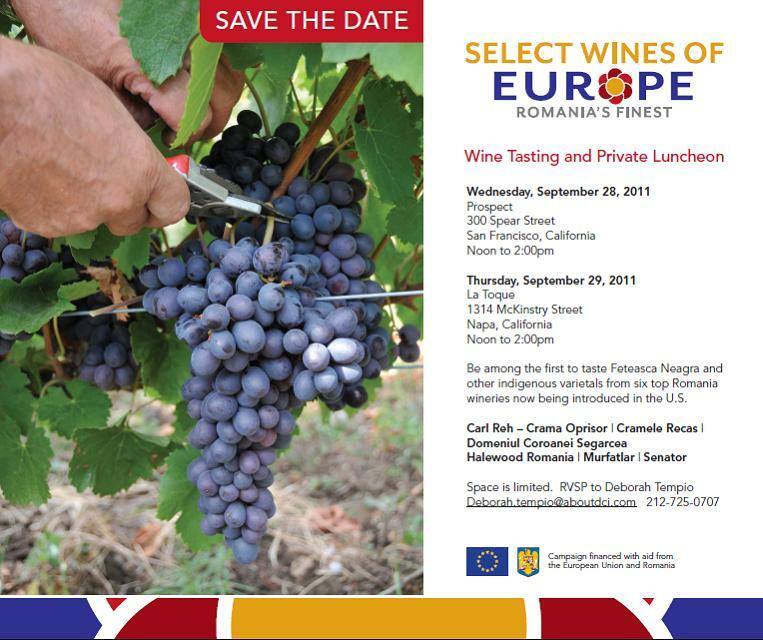 On September 28 and September 29 , a Romanian Wine tasting event will be organized in San Francisco and Napa. The Romanian Honorary Consulate in San Francisco is organizing a Roundtable Discussion with Dr. Mihai Ionescu, the President of ANEIR (Romania’s National Association of Exporters and Importers) on Thursday, August 25, 2011, 18:00, at the offices of the Honorary Consulate of Romania, 44 Montgomery Street, Suite 400, San Francisco. The request for this discussion originated from ANEIR, which expressed the desire to consult with a small group of selected members of the Romanian Diaspora on possible business opportunities for Romania and to identify steps towards implementation of such opportunities. The main focus of this discussion will be to identify ways to boost the Romanian exports of organic goods, food supplements and wine. The Second Edition of the Romania Film Fest. / Forum will be held in at Stanford, April 1-6 2011. This year, the Film Director Florin Serban will be attending the festival with his feature film ”If I Want To Whistle I Whistle”, winner of the Silver Bear and the Alfred Bauer Prize for innovation in film-making at the Berlin Film Fest. 2010.